High Country Market Review 2017! The statistics are in and 2017 proved itself to be a good year for real estate in the NC High Country! To all of the High Country home-owners (and future home-owners! ), this information is key to making wise investment decisions and plans for the future. Vincent Properties has a passion for real estate and market data, so we are proud to share our knowledge with you! Below are the key highlights of 2017 and how it compares to the past few years in real estate. We hope this data proves to be of great use to you! You can find more subdivision specific data by clicking here! This graph shows by month: the number of active residential listing (red), the number of sold residential listings (blue), and the absorption rate(green). The absorption rate is a key indicator for real estate professionals on the current pace of the market. For instance, for January 2018 (on the right of the graph), the absorption rate is approximately 8.89 . This means, based on sales and the amount of houses currently on the market, that it would take about 8.89 months to sell every house. As you can also see by the graph, Jan 2018 has the lowest absorption rate and the smallest amount of housing inventory. 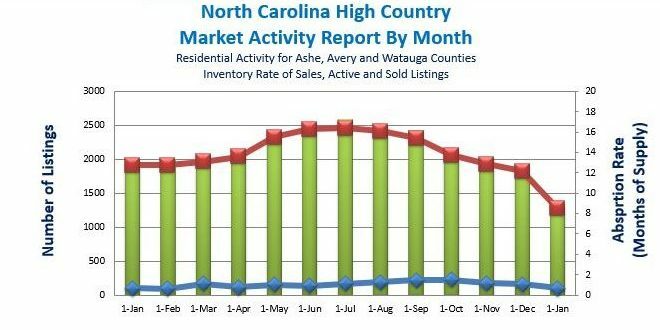 First of all, this decrease in listings is typical for the NC High Country real estate market because of Wintry conditions. No one wants to pack up and move in the cold snow! Secondly, this is another indicator of the real estate market continuing to progressively balance out from a buyers market. Boone’s average sold price for single family homes increased to $333,000. That is a 7% increase over 2016’s average sold price! The price per square foot increased from $138 to $150 between 2016 & 2017. As always, we are happy to answer any questions or provide a consultation on your property! Real Estate and the NC High Country are our passion! You may call our office M-F 8:30 am -5:30 pm, and Saturdays from 9 am to 5 pm to speak to our qualified REALTOR® on duty. Or you may email our office anytime at Sales@VincentProperties.com!